INCREDIBLE & EFFICIENT PSU WITH RGB CAPABILITIES Delivering 80 PLUS Gold efficiency, the Toughpower Grand RGB PSU comes with capacities up to 750W. It features a pre-installed patented 256-colour Riing 14 RGB fan that offers five vivid lighting modes and a built-in memory function. 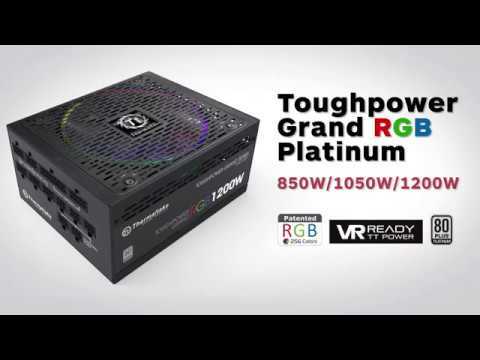 The Toughpower Grand also comes with an all-powerful fan that allows custom RGB lighting possibilities. Built with premium components and a generous 10-year warranty, this fully modular PSU delivers near silent operation, offers hassle free installation and gives reliable performance. If you are looking for a modern, stylish power supply with advanced features and aesthetic appeal, the 750W RGB by Thermaltake is the perfect addition. ULTRA-QUIET SMART ZERO FAN The Toughpower Grand RGB Gold Series comes fitted with an intelligent Smart Zero Fan that ensures your fan only operates when it’s truly needed. Experience zero noise when fan is operating below 20% working load for minimized noise, or if you prefer a switch is provided if you want the fan to spin constantly. INTUITIVE SMART RIING FAN BLADE Riing 14 RGB fan blade has been pioneered for high static pressure requirements of demanding applications and are optimized to enhance static pressure to further improve cooling performance. The weak inner circle is focused by the concentrated compression blade to allow the outer section of the fan blade to pressurize the air. The Toughpower Grand PSU also features hydraulic bearings and an anti-vibration mounting system to deliver silent operation and ultimate stability, with anti-vibration rubber pads for 80% protective coverage. ONE BUTTON DELIVERS 256 IMMERSIVE COLOURS The RGB lighting button on your PSU can be used to switch the fan colour, with a 256 Colour RGB Cycle with variants consisting of Solid Red, Green, Blue, White and a LED Off mode. The built-in memory function saves the colour you choose for every time you turn on your PC. This PSU grants remarkable functionality and aesthetics in all cases, especially Open Frame or Towers. 80 PLUS GOLD CERTIFIED AND Kaby lake READY The Toughpower Grand RGB is 80 PLUS Gold certified as it easily delivers up to 90% efficiency under real world load conditions to promise lowest power losses, along with being optimized to work with Intel’s Kaby Lake C6/C7 States to offer great energy saving. 750W Thermaltake Toughpower Grand RGB, 80PLUS Gold, Full Modular, SLI/CrossFire, 62.5A +12V, 140mm Fan, ATX PSU is rated 5.0 out of 5 by 1. Rated 5 out of 5 by Wipeout from Good looks, stable overclocking, good PSU This power supply is just what I needed, more power and stable voltages for my system. It has made overclocking my graphics card so easy feeding it with low tolerance voltage control. It also looks great, my last bottom dwelling psu was fan down to use cool air from outside the case but this deserves to be fan up! Riing fan looks great in my system matching the same fan design as the rest and the colours look, RGB is an added bonus. Its also a high quality product in my eyes, good fit and finish and the packaging was high quality also. Presented well and even had a bit of cloth around it. Silent fan mode is a bit pointless as turning off at low output offers no difference as the fan is so quiet in the first place In conclusion, its a very good performing power supply that looks great and offers great stability. My only real negative it the price! Other brands, some bigger brands offer more power for your pound. I really wanted the 850w for more upgradability but it was just out of my price range. Oh and for some reason it did not come with a UK plug lead......?